A KATE MOSS RATHER THAN A MADONNA, AN AUDREY HEPBURN RATHER THAN A MARYLIN MONROE, A NATURAL ELEGANCE THAT IS BEYOND FAD AND FASHION – TRULY A CLASSIC BRUICHLADDICH! So the marketing department is a having a hard time explaining their new product, so would you go to nature to explain the wonderful elegance of your new spirit, NAH! Everyone does that, let’s talk about women! Well, I can’t blame them because it’s a darn good subject. I’ve spotted Bruichladdich canisters a few times in stores and I am traditionally adverse to projects or products with over the top marketing because I think they are hiding something. Sometimes I’m right, sometimes wrong. Bruichladdich Distillery, like many, have a past like most people. You hit rock bottom, maybe shut down and then all of a sudden you are reincarnated. Bruichladdich distillery is one of those stories, and I am one of those people. So I can identify with struggles, hopes, pains, and occasionally victory that comes when you’ve been counted out to only come back stronger. Jim McEwan, head distiller, and company have won many awards in the past few years for their efforts and have perhaps started a cult following. Curiosity has gotten the best of me along with some recommendations from www.Ralfy.com. The references to Kate Moss may have had an influence also. 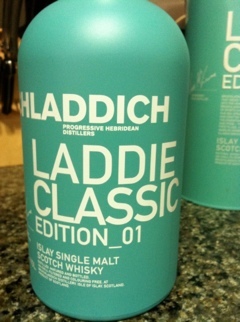 So this is Bruichladdich’s “Laddie Classic” and it is described as “smooth, floral and elegant spirit, matured purely in American Bourbon Casks. This bottle was filled in 2009 and is 46% ABV or 92 proof. It is un-chilled filtered, as God intended, and has no artificial coloring. The nose is fairly floral and strong, even after wading through the alcohol fumes it holds up strong. Taste, complete, balanced and almost buttery was my first impression. Great mouth-feel and the finish comes up a little tart on the top of my tongue, then fades like a genteel waiter. First go at it, I like it, it’s a bit different, maybe like eating a tart green apple? Islay? Very different. The Peat that you would expect comes through on the second taste, and lingers around the edges of the palate. The finish now reminds me of a Rosado cigar wrapper? Must try. Hey John – we don’t have a marketing dept here at Bruichladdich, we just follow the Muse wherever it takes us. This time the Muse took us to leggy blondes in Agent Provocateur – hey, we’re simple folk and we know what we like! Thx for the review – and if you like the CLASSIC, try our new 10 Year Old – some of the very first spirit we distilled, and finally 10 years old. Sadly no girls though – what were we thinking? I did enjoy your product. I do look forward to many more, and yes, more leggy blondes will be appreciated. Dear John, Where can this be purchased? NYC? I cannot find it but had a bottle in UK recently. Mistake not to bring back a case. Robin, unfortunately it’s kind of a scavenger hunt. Only a liquor store that values variety will probably have it. You may be best served by calling a few, a good store will try to hunt one through their distributors. Thanks, worth the scavenging, but next time, importing my own. Robin – try Park Avenue Liquors – they stock a good range of Bruichladdich.